Aston Martin Vantage. 2017 to date (prod. n/a). 3-door coupé. F/R, 3982 cm³ (V8 DOHC). Vantage for the 2010s, no longer officially V8 or V12 Vantage. AMG twin-turbo four-litre engine from DB11, but with more torque (685 Nm) and 510 PS; clear design links to the movie-only Aston Martin DB10 (from Spectre). 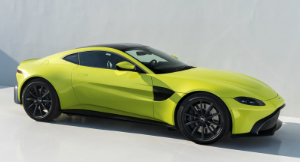 Lowest Aston grille to date, slim LED head- and taillights, and plenty of downforce and decent aerodynamics—large rear diffuser aided the latter. Interior rethought with gear buttons in triangular pattern, and eight-inch touchscreen; eight-speed ZF automatic as standard. Dynamic torque vectoring and electronic rear differential helped with agility and straight-line stability.